We are nearly complete with the first round in Bracket Eight in the Battle of the 2012 Books. This match-up features Destiny's Flower by Linda Harley versus A Pretty Mouth by Molly Tanzer. The winner will be the book I (Aaron) most want to continue reading after 25 pages. Destiny's Flower: Infinity Publishing (a self-publishing service, not to be confused with Infinity Plus in the UK), September 2012, 312 pages. 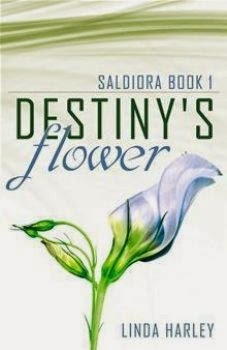 Destiny's Flower is labeled a science fiction romance. In the opening 25 pages, our leading lady Lynn Davis is abducted while teaching a college course and spirited away to the interstellar spaceship Destiny (although she doesn't yet know she's on a spaceship), which promptly has to battle past a fleet of enemy ships to get away from Earth. The dashing Lord Kyle von Talion needs Davis for something, we don't know what, and when he declines to tell her, she tries to escape through a ventilation shaft, putting the crew of Destiny in a tizzy. Linda Harley is a new author, with a PhD in Applied Physiology. A Pretty Mouth: Lazy Fascist Press, October 2012, 227 pages, cover art by Matthew Revert. A Pretty Mouth is a novella collected with four related stories, all of which place Lovecraftian creatures in a slightly odd context. The first 25 pages consist mainly of the story "A Spotted Trouble at Dolor-on-the-Downs," set in Victorian or Edwardian times. When a Mr. Wooster loses a drunken wager, the price falls on his man Jeeves, who must confront a strange octopus-like creature. A Pretty Mouth is the first book by Molly Tanzer, whose latest effort is the Weird Western Vermilion. The Battle: We've had some good luck in the Battle of the Books recently with self-published books that were written at a professional level. Untimed by Andy Gavin, for example, has already advanced to the second round of this bracket on the strength of a very entertaining opening section. Unfortunately, Destiny's Flower is not written to that standard. Linda Harley may yet develop into a fine writer, and if she does, she will look back on Destiny's Flower as an amateurish early effort. Comparing the first section of this book to A Pretty Mouth's strong opening illustrates what I mean. Let's start with the descriptions in the two narratives. In the first few pages of Destiny's Flower, Lynn Davis is taken away from this planet and thrust into a bizarre universe of spaceships and quantum torpedoes. Except, it's not bizarre at all; rather, it's absurdly mundane. These people from another world sit on leather couches, eat peanut butter and jelly sandwiches, decorate their walls with paintings of women in straw hats in fields of lilies, and sleep on "a Victorian double bed covered with a white comforter embroidered with blue flowers." Davis's interstellar trip, which should be bewildering, is about as strange as staying at a Motel 6. Dolor-on-the-Downs is, like so many seaside towns, a place of distinct seediness. There was one street of hotels acceptable for human habitation, and the rest of the place was a hotch-potch of inferior lodgings, taffy shops, ice cream parlors, boardwalks, performers busking on streetcorners, teashops where the very windows bore a light sheen of grease, and, of course, public houses. During the season, children with sticky faces and sunburns run hither and yon without heed for the eardrums of others, and the beaches are clogged with their adoring parents, also sunburned, but less-often sticky-faced. 'Really,' said the Lord Calipash, and though I am neither a whimsical man by nature, nor the heroine of a Gothic romance, I felt a chill as his eyes raked over me. That is wonderful stuff. Through the opening pages, Destiny's Flower has yet to find that kind of a voice. Which is the better story idea, a modern woman being abducted and thrust into interstellar politics, or a Lovecraftian monster encountered by Jeeves the butler? The latter strikes me as more original, but really it doesn't matter which is better. Story ideas are plentiful, but they don't get you anywhere until you develop the craft to tell the story effectively. The opening of Destiny's Flower has done little to pull me into the story. Meanwhile, Molly Tanzer's confident and witty writing style has me convinced she has a story to tell that I want to keep reading. A Pretty Mouth advances to the second round to take on either Grim by Joseph Spencer or Blood and Feathers by Lou Morgan. Our Story Recommendation of the Week feature has fallen by the wayside in favor of the Battle of the Books, but I'm determined to start posting story recommendations again. In light of the hot mess that is this year's Hugo Award ballot in the short fiction categories (more on that to come), I think it's important to call attention to how much wonderful short fiction is being published in our genre. 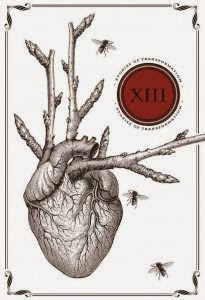 My first Story Recommendation of the Week of 2015 goes to "Two Will Walk With You" by Grá Linnaea, from the anthology XIII: Stories of Transformation edited by Mark Teppo. "Two Will Walk With You" begins with 17-year-old Japanese girl Ayu desperately running from the keep where she has lived for seven years, learning Christian magic. She has killed a priest in self-defense, and she knows the punishment for her crime: a Socius, or Tomo, a demon companion that will never leave her alone. They trudged silently through the wet of the Azusakawachi swamplands toward the Maibara valley. The sun shone harshly, reflecting rainbows off the misty water. Canary grass grew close and sodden to the path they forged. Neither had spoken since the night before. Midday Hageatama broke the silence. "You have a Tomo on you, girl." Ayu said nothing. They walked further. "The Socius." Hageatama butchered the Latin. "The Tomo. No one escapes." He poked his walking stick at her back. Ayu spun and slapped the stick away. "I know!" Her voice cracked. "No one knows more than I do! The Socius is woven to my soul, it won't stop—"
Hageatama cut her off, his voice loud and gentle. "It can't stop. It is made from your soul. It doesn't have one of its own." He pointed a dirty nail at Ayu. "And you can't escape." Ayu's fear was replaced with a surprising feeling. "I almost feel sorry for it." Hageatama's head shot up. "The Tomo?" She rubbed her chest. "It must be awful not to have a soul." Between the curse of the Toro and Ayu's sexual preferences, it seems impossible that things could turn out well for her, and yet she and Hageatama refuse to abandon hope. "Two Will Walk With You" exemplifies everything short fiction can offer: well crafted language, a memorable setting, a main character we quickly come to care about, an engaging story. And—dare I say it?—a message. A message that has nothing to do with politics, a message that is conveyed with subtlety, and yet it's what the story at its core is all about. "Two Will Walk With You" grapples with how we can live our lives in a way that is satisfying and meaningful, even when fate has stacked the deck against us. It's the kind of subject, relevant to all of us, that I expect a top-notch author to examine, even if there are no easy answers. Linnaea does that beautifully. Grá Linnaea is a fellow Writers of the Future winner whose work has also appeared in Shimmer, Apex, IGMS, Daily Science Fiction, and other places. Today's first-round contest in Bracket Eight of the Battle of the 2012 Books features Dead Religion by David Beers going against Libriomancer by Jim C. Hines. The winner will be the book I (Aaron) most want to continue reading after 25 pages. 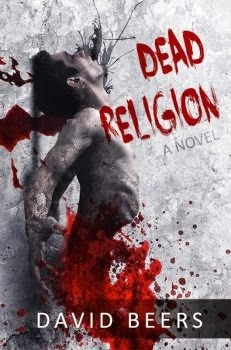 Dead Religion: Self-published, September 2012, cover art by Renu Sharma. Dead Religion is the stand-alone first novel by David Beers, who has since gone on to publish serialized novels called The Devil's Dream and The Singularity. The opening 25 pages of Deal Religion jump between three different time periods. In the present day, FBI agent James Allison is sent to investigate a terrorist bombing in Mexico, believed to be the work of an American of Mexican descent, Alex Valdez. James is reluctant to leave his 15/16-year-old brother, for they have no surviving relatives. In an earlier period, Alex Valdez struggles with recurring nightmares, which he and his wife Brittany fear threaten his delicate mental health. In the earliest time period, Alex nearly commits suicide, believing that he cannot escape the evil presence that killed his parents. The narrative hints this presence may be some kind of remnant of the Aztec religion. Libriomancer: DAW, August 2012, 305 pages, cover art by Gene Mollica. Jim C. Hines is a fellow Writers of the Future winner, who has published four novels in his "fairy tale princess" sequence, three novels and a collection in the Goblin Quest universe, a stand-alone mainstream novel, and a bunch of short fiction. He has also won a Fan Writer Hugo Award for his blogging. 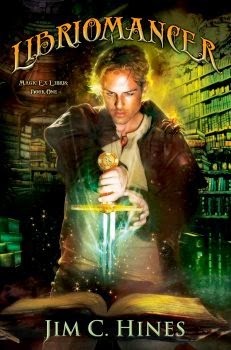 Libriomancer is the first volume in his latest series, Magic Ex Libris. The first-person narrator of Libriomancer is Isaac Vainio. (His first name is likely a tribute to Isaac Asimov, the first of countless SF/F references and in-jokes soon to follow.) Isaac is a book-lover and huge science fiction and fantasy fan, and he is a libriomancer, a rare person who can conjure objects out of the books he has read. He works for a secret magical society called the Porters. Having fared poorly at field work, Isaac now occupies himself as a librarian in Michigan's Upper Peninsula, cataloguing books that may be of use to his fellow magic-doers. In the opening pages, his library is attacked by three vampires, whom he fights off with the help of his pet fire-spider Smudge, a dryad named Lena, and a disruptor-pistol he pulls out of the book Vulcan's Mirror. Lena then tells him that a large-scale battle has erupted between vampires and the Porters, but there are hints that the conflict goes well beyond vampires. 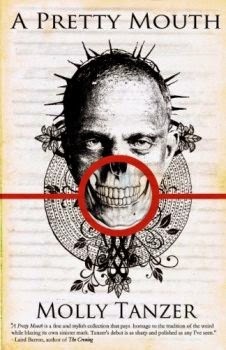 The Battle: Dead Religion is self-published and it shows. The book desperately needed a professional editing job—there are no page numbers, tenses vary erratically, and Alex's brother's age changes from 16 to 15 with significant results (he says he can drive himself to school, but two pages later he's become too young to drive). Despite these problems, there is an intensity to the narrative that I admire. Also, I think Beers handles the shifts between different time periods quite effectively, and the hints about Aztec mythology are interesting. The trio stopped to study the address of the post office across the street. One reached into her pocket and pulled out a crumpled piece of paper. Her hand glittered like a disco ball in the afternoon sun as she scanned the buildings. She tugged her sleeve over her hand a second later, but that one glimpse was enough to identify them as Sanguinarius Meyerii, informally known as sparklers. If you don't get the joke, Libriomancer is probably not for you; but if it made you laugh, you may be in Libriomancer's target audience. The book is written for people just like Isaac, people whose homes are overflowing with books, people who never tire of visualizing science fiction and fantasy scenarios, people who would love nothing better than the ability to bring something from their favorite books to life. Is it pandering that Hines targets his book so shamelessly at core fantasy readers, making his hero a fellow fantasy-obsessed bookworm? Um, do I care? I'm having as much fun reading this as I suspect Hines had writing it. Libriomancer advances to the second round to face Untimed by Andy Gavin. We continue the first round of Bracket Eight of the Battle of the 2012 Books. The bottom half of the draw begins with Untimed by Andy Gavin against Bad Apple by Kristi Petersen Schoonover. The winner will be the book I (Aaron) most want to continue reading after 25 pages. Untimed: Mascherato, December 2012, 326 pages, cover art by Cliff Nielsen. 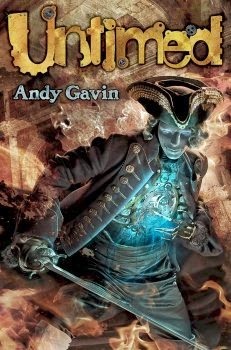 Andy Gavin is a successful video game developer whose previous book, The Darkening Dream competed in the Winter 2012 Battle of the Books. Untimed is a young adult time travel story. The protagonist Charlie is a kid nobody seems to notice. Even his mother has to leave herself notes to remember her son's name. Charlie's father is seldom around, and the father's most recent visit was cut short when an odd detective came looking for him. Charlie later spots the detective and sees him unbutton his suit and wind himself. Charlie follows the clockwork man through a rift in the street and finds himself in the 18th Century. He bumps into a girl named Yvaine, who (for a shilling) explains that Charlie and Yvaine are among the small population of people who can travel through time. The bad news is that males can only travel to the past; it seems Charlie can't get home. Bad Apple: Vagabondage, August 2012, 186 pages, cover art by Jonathan Willmann. Kristi Schoonover has published a good deal of short fiction in the mainstream and genre small press, some of which is collected in Skeletons in the Swimmin' Hole. 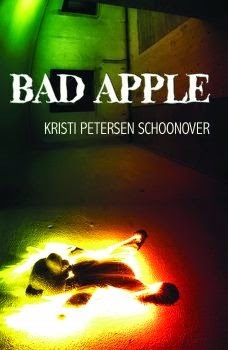 Bad Apple, her first novel, tells the story of a young woman named Scree, who grows up on an apple orchard. As the book opens, Scree has not yet started first grade, yet she already masturbates with the help of her favorite teddy bear. One day she accidentally drops said Bear into a well. She calls her mother for help, but then panics at the thought that Bear will tell her mother what she's been doing, so she pushes mother down the well also. That leaves her with a father who is probably not her real father and a womanizing brother, who soon drops his first child in Scree's lap to care for. The Battle: This is a battle between two independent books, so the first question is whether their respective authors can actually write at a professional level. Happily, the answer here is yes. Both Gavin and Schoonover make effective use of language to tell their young protagonists' stories. Untimed is written in a quick-paced, breezy style that works very well. The prose in Bad Apple is more dense, which is suitable to its much darker tone. While I like the writing in Bad Apple, however, I'm finding it difficult to become absorbed in the story. Much of the opening 25 pages show us Scree's unhappy childhood after her mother's death. But I'm finding it awfully difficult to feel any sympathy for Scree's troubles, when those troubles are a direct result of Scree killing her own mother. Even if we assume that Scree was too young to understand fully what she was doing (and the narrative suggests otherwise—Scree is very precocious, as evidenced by her early experiments with masturbation), it's very difficult for the reader to feel an emotional connection with her. In contrast, the opening 25 pages of Untimed do a wonderful job of pulling the reader in. In only a few pages, Gavin makes Charlie very sympathetic by showing his stoic acceptance of the fact that nobody around him can remember who he is. Then, in a YA twist that never gets old, Gavin shows that this is actually because Charlie is very special. Before 25 pages are up, Charlie has already encountered strange clockwork beings, fallen through a hole in time, met a potential love interest, and even caught a glimpse of Benjamin Franklin. We are off and running! I think nearly any young reader would be pulled in by this opening, and it works awfully well for some of us old readers too. Untimed advances to the second round to take on either Dead Religion by David Beers or Libriomancer by Jim C. Hines.